1605년 정월 9일에 이미 작고한 선무일등공신(宣武一等功臣)인 덕풍부원군(德豊府院君) 이순신에게 전라도 부안, 고산, 충청도 온양, 직산, 천안, 진산, 은진 등지에 있던 관노비(奴1, 婢7)를 상으로 내리는 사패교지이다. 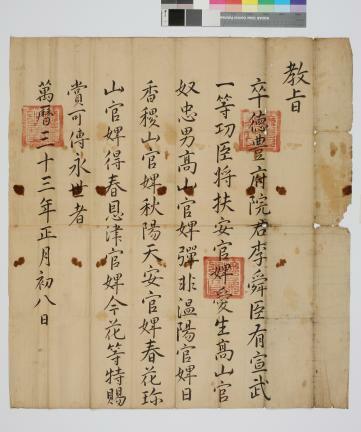 This royal edict was posthumously issued in 1605 (the 38th year of the reign of King Seonjo of the Joseon Dynasty) to Prince of the Court from Deokpung Yi Sun-sin (enrollment to the First-class Military Order of Merit during the reign of King Seonjo). According to the edict, he was awarded a group of slaves (one man and seven women) from Buan and Gosan in Jeoll-do, and from Onyang, Jiksan, Cheonan, Jinsan, and Eunjin in Chungcheong-do.